What's in a name? When it's "skunk vine," it can't be good. This obnoxious, weedy vine (Paederia foetida) is a serious problem in Florida and Hawaii, is invading parts of the southeastern United States, and is spreading elsewhere. In addition to growing densely over trees, ornamentals, and cash crops, skunk vine is so smelly the Japanese nicknamed it the "human gas vine." Agricultural Research Service entomologists Robert W. Pemberton and Paul D. Pratt, of the Invasive Plant Research Laboratory, in Fort Lauderdale, Florida, have formed a two-man skunk vine combat team. They search far and wide for natural solutions to this growing problem. P. foetida is a woody vine that lacks thorns. Its species name, foetida, was given because of its fetid smell—an overwhelming scent imparted by sulfur compounds in its leaves. And when the leaves or stems break, an even more potent foul smell is released. (K10735-1) This invasive plant grows both high and low, often developing into a thick layer of overlapping vines across the soil surface, smothering understory plants. Climbing vines can scale and cover midlevel and overstory vegetation, eventually collapsing trees or their branches. It captures sunlight efficiently in both high and low locations. In addition to the U.S. mainland, skunk vine has invaded Hawaii, and there have been cases of the weed growing in Mauritius, Reunion, Sri Lanka, and New Guinea. Skunk vine is listed as a Category I Florida Pest Plant weed, which puts it among the most invasive species in the state. There it is most severe in natural vegetation, and in Hawaii it causes the most trouble in horticultural crops. P. foetida was reportedly introduced as a potential fiber plant to an unknown Florida location by the U.S. Department of Agriculture (USDA) sometime before 1867. By 1916, it was identified as a problematic weed, when it was found to have entangled ornamental plants near the city of Brooksville, in west central Florida. (K10736-1) The vine continued from its epicenter near Brooksville to the north and south—showing that it could withstand ecological conditions ranging from tropical to temperate. Over the past 7 years, it has been reported throughout Florida, from Tampa north to the panhandle. Skunk vine was also found in North and South Carolina and Georgia in the late 1990s and recently in Texas and Louisiana. In a 1999 study by the University of Florida-Gainesville's Center for Aquatic and Invasive Plants, the estimated cost of manually removing skunk vine from a moderately infested area was $4,006 per acre (or $1,622/hectare). Cost estimates for herbicide applications to a moderate infestation (33.6 vines per square meter) was $1,593 per acre ($645/ha). To make matters worse, either method damages the valued vegetation that the vine infested, and neither treatment gives complete control. This past summer, Pemberton focused on the plant's native range in Japan and Nepal as possible sources of insect biological control agents that might curb P. foetida in Florida and Hawaii. In June 2002, Pemberton and Pratt traveled to the island of Kyushu in Japan to work for 10 days with entomologists from Kyushu University, conducting surveys to see what insects feed on skunk vine. That same month, they surveyed skunk vine for 2 weeks in and around Tokyo with the help of entomologists from Tokyo Metropolitan University. Pemberton and Min Rayamajhi, an ARS plant pathologist in the Invasive Plant Research Laboratory, went to Nepal to conduct additional surveys for natural enemies of skunk vine in the Kathmandu Valley for 3 weeks in August 2002. While in Nepal they discovered an iridescent chrysomelid leaf beetle that feeds on the leaves of skunk vine both as a larva and an adult and appears to be related to the chrysomelid beetle that successfully controlled klamath weed (St. John's wort), Hypericum perforatum, during the 1950s and 1960s. Two sawfly species were also found in Nepal, both of which feed on the skunk vine leaves—lining up side by side on a leaf, companionably eating it together. Pemberton and Pratt also found a stem gall-maker, a moth in the family Sessiidae that forms spindle-shaped galls up to 1 inch in diameter on skunk vine stems. Despite the exotic locales, "These trips are hardly a vacation," says Pemberton, who is mainly responsible for the foreign exploration. "We're very busy." During surveys, Pemberton and Pratt set up cultures of insects collected during the day and tended them at night to evaluate feeding habits. The scientists also reared immature insects to adulthood so they could be identified. (Immature insects can be extremely difficult to identify.) They do some of this work at the universities they visit. At other times, they use their hotel rooms. "It definitely is stinky," says Pemberton of the skunk vine. "If you have cultures you're working on, your hotel room starts to smell. If you're in the hotel business, don't let field biologists stay. You don't know what they'll bring in," he jokes. What the two scientists brought back to the United States is hope, in the form of one high-priority candidate biological control agent to combat P. foetida—the flea beetle. They also brought back a lace bug worth evaluation, and many other natural enemies were discovered during the surveys that may be considered for testing and future introduction. Of all the critters, it's the flea beetle, Trachyaphthona sordida, that looks the most promising. These small beetles have big hind legs and readily hop and jump, which is how they got the name "flea beetle." Pemberton and Pratt were fortunate to collect them while in Kyushu. The beetles had not been collected for more than 40 years and appeared to be present as adults for only a short period during the early summer. "One important aspect of flea beetle larvae is that they feed on, or 'mine,' P. foetida roots," says Pratt, who is working mainly on release and establishment of potential biocontrol insects. Their consumption of the roots and root hairs limits the vine's ability to absorb water and nutrients. This might cause the plant to die during the dry season. The team captured three batches of 200 beetles in 2 weeks and shipped them to a quarantine laboratory at the Hawaiian Department of Agriculture, in Honolulu. Scientists there, led by biological control section chief Ken Teramoto, have agreed to collaborate with the ARS scientists by conducting host-specificity testing. A new, state-of-the art quarantine facility is under construction at the Invasive Plant Research Laboratory and will be completed early this year. This facility will enable ARS scientists to conduct more host-specificity testing in Florida. 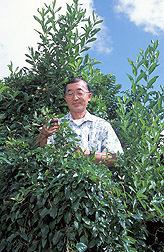 The scientists have previously tested the psyllid in Gainesville and in Hawaii and Australia. Testing at the Hawaiian lab will determine what plants the insects tend to feed and develop on to assess potential risks from their use. This flea beetle has been recorded to feed only on skunk vine. Flea beetles are usually very narrow specialists, using only a few species in a group. 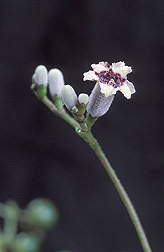 Since T. sordida is an apparent specialist, and because neither Hawaii nor the continental United States has any economic or native plants that are closely related to skunk vine, the flea beetle or other skunk vine biological control agents pose virtually no risk to agriculture or our native ecosystems. But before any insect can be released for biocontrol of skunk vine, the new agent must be tested and scrutinized by committees of federal and state scientists, an environmental assessment must be written, and finally a release permit from the USDA Animal and Plant Health Inspection Service can be issued. Another insect taken from Japan and placed into quarantine at the Hawaiian lab is a lace bug, Dulinius conchatus, that originated in India. The insect was accidentally introduced in the early 1990s into Japan, where Pemberton and Pratt collected it. The lace bug was found to damage skunk vine in the area surrounding the old Osaka airport. 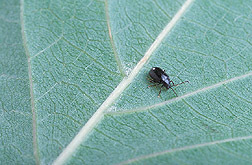 Pemberton learned about both the lace bug and the flea beetle in Japanese scientific literature, which he obtained during a 1997 feasibility study of biological control of skunk vine in Japan. Natural enemies discovered for skunk vine are likely to prove useful against sewer vine, Paederia cruddasiana, a related weed that is becoming a problem in the Miami area. "We hope that these biocontrol agents can suppress P. foetida sufficiently for the plant to become a minor part of the flora," says Pratt. Pemberton agrees, and adds, "We want to keep its density low enough that it ceases to be a problem—no longer a dominant plant and unable to cause any further ecological damage. "—By Alfredo Flores, Agricultural Research Service Information Staff. Robert W. Pemberton and Paul D. Pratt are with the USDA-ARS Invasive Plant Research Laboratory, 3205 College Ave., Fort Lauderdale, FL 33314; phone (954) 475-0541, fax (954) 476-9169. "Scouring the World for a Skunk Vine Control" was published in the October 2003 issue of Agricultural Research magazine.